My first time trying out H&M nail color and I have to say that I was pleasantly surprised. Normally with cheap nail color you get poor pigmentation and even worse wear. Honestly I only bought this one because the color caught my eye when I was there looking for something else. I like this one. "Looks great on you" is an earthy-almost-brown shade of orange. I think it looks really nice on dark skin not as in your face as you would expect from orange nail polish. I think this will look good on light skins too... its just one of those shades. The nail color is affordable retailing for €3.95 for 9ml of product and like you should have already guessed is available at H&M. 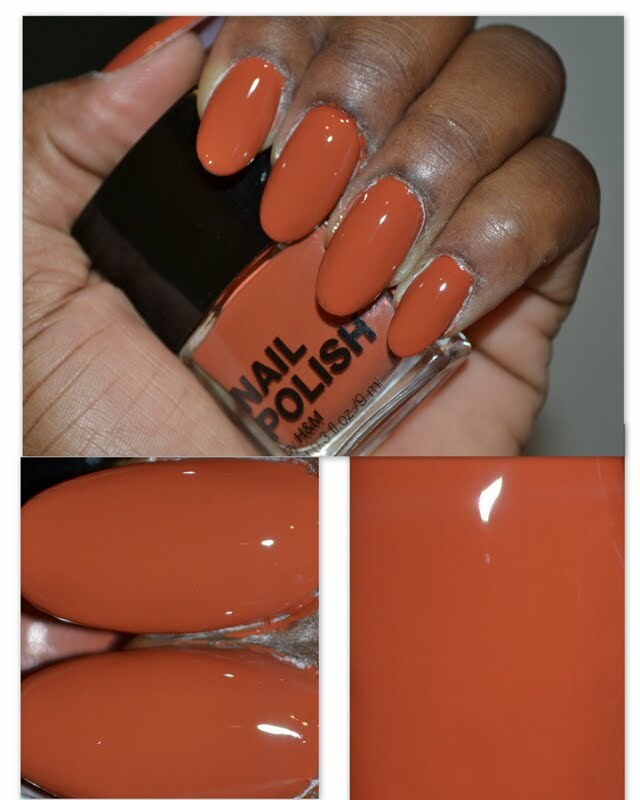 The color slides on smoothly and with 2 coats (like I'm wearing above) You get an opaque cover. I like the square shape of the bottle, I think it makes that nail color look like it cost much more than it actually does. The square cover might feel a bit awkward during application though. The brush is a little wider than a vintage nail polish brush. It does look great on you! wat a coincidence i was jus contemplatin buyin one today in a H&M store!